Ocean Heart Necklace https://www.review-australia.com/au/ocean-heart-necklace-grey/RE19ACC046.RECRM046.OneSize.html Every lady (and outfit) needs a classic pearl necklace. Wear with your favourite outfits for an extra layer of style. 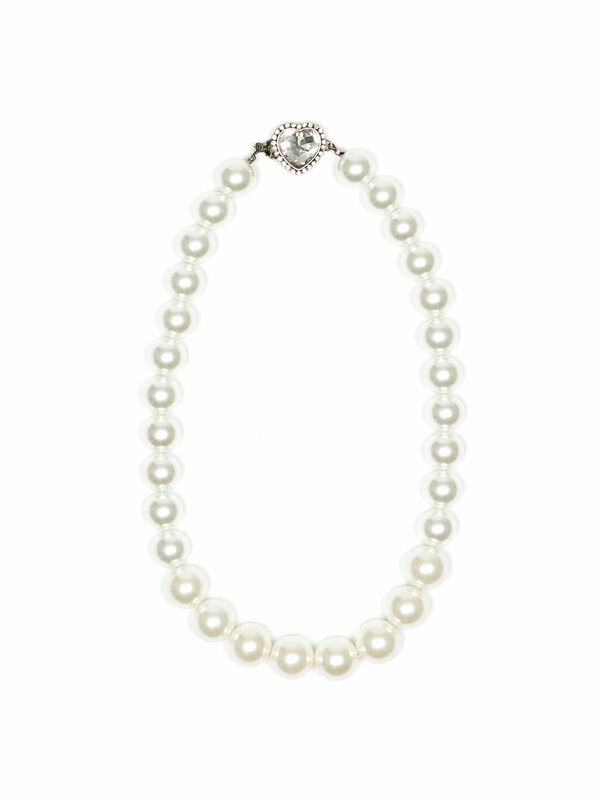 Every lady (and outfit) needs a classic pearl necklace. Wear with your favourite outfits for an extra layer of style. Ocean Heart Necklace is rated 4.4 out of 5 by 14. Rated 4 out of 5 by Hayley from So pretty! Really adore this necklace- adds such prettiness to an outfit. Only slight issue is the clasp fittings are not that strong and necklace is a little heavy - so prefer to wear clasp in front to not put weight through it - but love that look anyway! Rated 5 out of 5 by Taminreview from Exquisited design I brought this yesterday. The necklace is gorgeous. I like wearing it the with the heart at the bottom as it looks beautiful either way, I like the clasp it's different but it works. Highly recommended this necklace. It makes any outfit pop. Rated 5 out of 5 by Joanne S from The Pearl Necklace I’d been looking for a pearl necklace for a while when Review released this. It’s bold with its large pearls and the heart shaped sparkly clasp adds just the right amount of bling. You can wear this with pretty much any Review outfit. Rated 5 out of 5 by Ruthie babe from Stunning pearls,goes with everything. The pearl necklace,is very chic. Really stands out quite a statement piece. I wear this necklace with a casual outfit as well as a dressy outfit. Will purchase the heart earrings to match. Overall very happy with my purchase. Rated 5 out of 5 by Phasi03 from So classy!! It is so pretty necklace which can add grace to any outfit. The only thing I was concerned was its clasp which is not that strong but it’s classy design made me forget that and buy it. Rated 1 out of 5 by Margy from Not good Really disappointed in the necklace. It's big and chunky and heavy. Bought it online and photo is deceptive... Don't think I'll ever wear it sadly.